Ever since I moved to France, I have been aware of the name of the “House” of Ladurée, which has been associated with the prettily coloured almond meringue shells we know today as Macarons. The Macaron appeared in Europe in the middle ages, but it antecedent appears to have been from Morocco and before that from Syria under the different name of the “Louzieh”. It is believed to have passed to France from Italy during the Renaissance and is likely that Catherine de Médicis introduced it to the French when she entered the French royal family. The first recipe for the macaron is found in a publication in the XVII century. Enriched by spices, liqueurs and jams the shells of the macaron were paired together in 1830 to form the shape of the macaron we recognise today. They were found in Belleville, the Parisian quarter with ganache or cream fillings in 1880 and were also fabricated by the “Maison Ladurée” which tinted the shells in pastel colours indicating their flavours. Despite living a stone’s throw from Paris, I have never, until yesterday tried one Ladurée’s masterpieces, but have always wanted to, and it is somewhat ironic that when I finally came to taste one, it wasn’t in France at all, but thousands of miles away in Bangkok! It wasn’t even that I was desperately hungry, or desperately curious. Since I regularly cook Macarons myself, and act as translator for the Institute Nationale de Boulangerie Patisserie for, amongst other things, the Macaron, I wanted to see what all the fuss was about, and if the Maison de Ladurée warrented the title of the grand master of the Macaron. 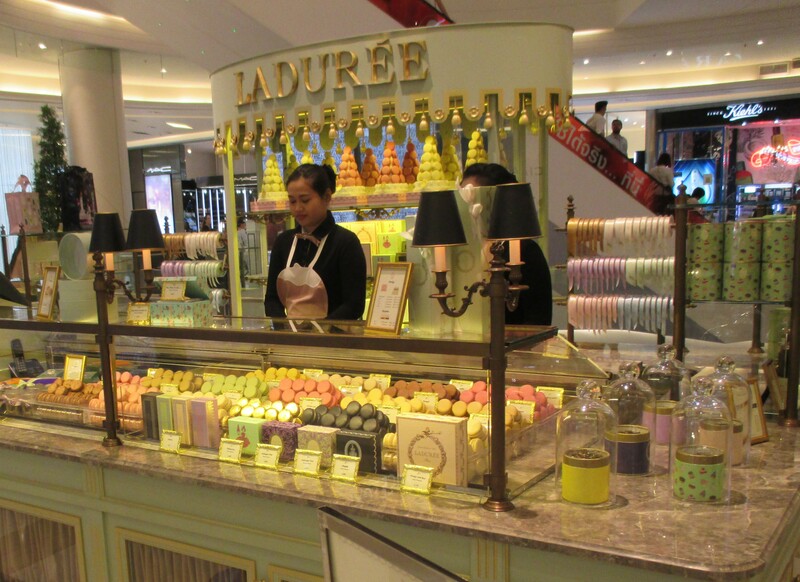 So why did I come to finally splurge on a Ladurée macaron in Bangkok of all places. Well the answer was the queue at the Skyrail BTS platform at Siam. Anyone who has travelled in Bangkok in public transport will know that it’s a pretty overwhelming affair, not least at rush-hour when there are literally thousands of bodies crushing into the train carriages. But of course getting into a carriage isn’t the only hurdle. First buy your ticket! The skyrail platforms have a few booths which at first glance look like ticket offices. So on our first outing we queued for tickets only to find that despite being six of us, the person behind the screen would only change our notes for coins, leaving us in the somewhat unenviable position of having to queue again at a little slot machine to actually get hold of the tickets, which we had to do one at a time. So yesterday when I looked at the heaving masses on the concourse, and then into my purse noticing with a grimace that I had only notes, there were only two choices, to queue twice, or to nip back into the mall and stop at the first shop possible, buying something innoccuous and getting some change as a result. 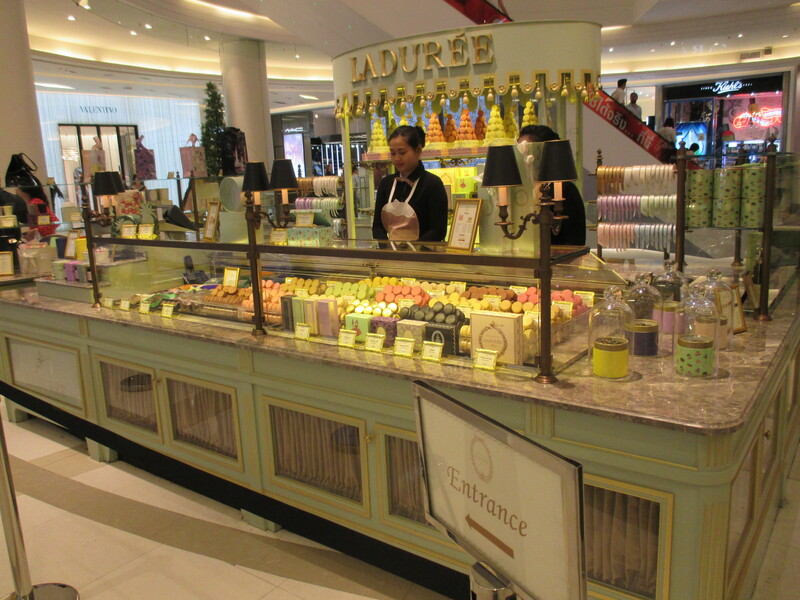 The first shop that I fell upon was Ladurée! To hand it to Ladurée, the display looked tempting. One macaron was even half dipped in gold! I selected my one solitary raspberry Macaron only to have a major heart attack at the price demanded. As their cheapest, the rapberry Macaron costed a whopping 200 baht (5€), and I was agast to see, whilst one server wrapped my little macaron in a beautifully crafted napkin “envelope” concoction, the other was pulling from the till a wad of notes for my change. It took much gesticulating to get across the message that I wanted a handfull of coins. I carefully cradled my little “treasure” back to the Skyrail station where my children were still manning their position in the queue for tickets, and egged on by them I took my first bite into my Ladurée macaron. There was expectant anticipation that for a few moments I would be transported to some higher realm of conciousness, a sort of gastronomic paradise. “Well” demanded the children, a few moments later, “Was it worth the inflated price tag, and was Ladurée synonymous with “heaven”. In a word, “No!”, it tasted like all other macarons the world over! Perhaps If i’d bought a gold dipped one, and melted down the gold, I might have appreciated its value. Perhaps Ladurée can be thanked for their clever idea of pairing the shells, and colouring them to denote their flavour, but the rest, as they say, is history. There are many patisserie chefs out there just as capable of making lovely macarons as the famous Maison de Ladurée for a fraction of the price. And I do hope that Ladurée has something else up its sleeve, as an excellent macaron rests with the imagination of it’s creator, and that could as easily be you and I.
Ladurée gives a total of about one! This entry was posted in beautiful shops, Cooking and recipes and tagged Bangkok, BTS, France, Home cooking, INBP, Institute Nationale de Boulangerie, Ladurée, Macaron, patisserie, Skyrail by frenchimmersion. Bookmark the permalink.